The silence is breaking across the country as sexual assault and harassment become more visible to the public. Change is on the horizon, but only if institutions develop concrete consequences for harassment and assault instead of letting perpetrators skate by. The UC system has been letting powerful men do just that. The most recent case of this is when Regent Norman Pattiz asked Heather McDonald, on tape, if he could hold her breasts and the UC did nothing. Pattiz, the chair of Courtside Entertainment Group, made the comment while McDonald filmed a bra commercial at the PodcastOne studio in L.A. The actions and words of Pattiz are examples of sexual harassment, and they are unacceptable. The Board of Regents, the governing body of the UC system, facilitates policy and expenses for the multibillion dollar budget of the UC. Regents are appointed by the governor of California for 12-year terms and there is no constitutional process for removing a regent from the board. 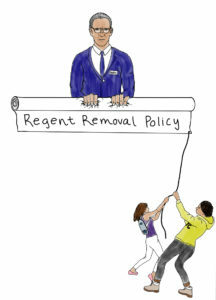 Even if a regent, like Pattiz, sexually harassed or assaulted someone, they can finish out their term. McDonald left PodcastOne and aired the tape, prompting Pattiz to issue an apology. McDonald suffered the consequences of Pattiz’s words by being driven out of her job, yet Pattiz has seen no significant repercussions for his actions. Students and the campus community have not kept quiet about this issue. The UC Student Association (UCSA) passed two resolutions demanding Pattiz’s dismissal. Still, the UC took no action against Pattiz after a year of him sitting on the board as a known harasser. Part of the reason is that the UC has no legal way of removing Pattiz. This is where the UC, and institutions like it, must change. When a representative of a public institution is found guilty of sexual harassment or assault, there must be a way to remove them from power. There must be consequences. Pattiz finally resigned on Dec. 28, 2017, telling the Los Angeles Times, “I have nothing to be ashamed of. My conscience is clear.” His last day is Feb. 16. Failed laws and a lack of protocol allowed Pattiz to remain in one of the most powerful positions within the system. His apology is washed away by his blatant disregard for his actions. Moreover, the system that allowed him to conduct business as usual is also responsible. By standing on the sidelines, the UC is contributing to a culture that allows men to objectify, harass and assault women. In response to Pattiz’s comments, the Board of Regents passed a policy that holds regents to the UC ethical and sexual codes of conduct in their private lives as well as their public lives. Regent Pattiz broke that code of conduct by objectifying McDonald. If the consequences are no more than a slap on the wrist, this will only encourage more covert perpetuation of inappropriate power dynamics, assault and harassment. Instead, there must be a way to remove regents in the event of an abuse of power. The UC system needs to establish tangible consequences for inappropriate actions and at last make actual strides toward confronting sexual violence and harassment, as promised by UC policy. The UCSA created a grading system for regents ­— an important step in monitoring regent behavior. Students should have an opportunity to give their input on who sits on the UC’s governing body. Regents need to represent the UC community, not make community members feel unsafe. We demand Pattiz take full responsibility for his actions and leave the board because of his wrongdoings ­— not to travel to Machu Picchu with his wife, as he told the Los Angeles Times. It is time to hold people in power accountable. The regents must outline a way to remove board members who’ve broken ethical and sexual harassment codes of conduct. As a university on the forefront of social and ethical research, within a system that boasts of “an atmosphere free of harassment, exploitation or intimidation,” we cannot tolerate those like Pattiz to continue to be let off.